"Transition" comes from Latin <transitio> ("tránsito"): change of position, estate, or concept to another. 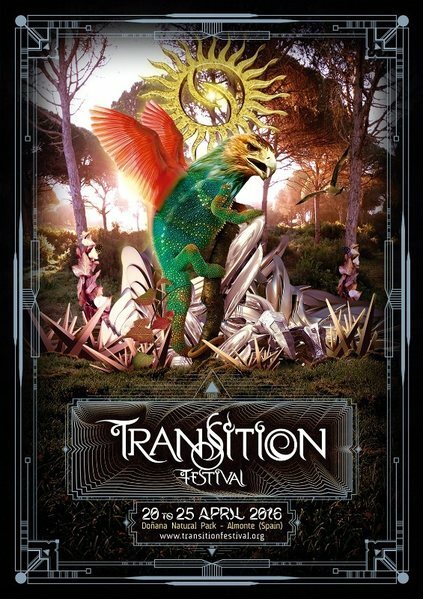 Transition Festival presents a new door into another dimension with a constructive intuitive intention: to expand human consciousness and the relation between the soul, the body, and its center of power. Due to this experience, a new connection with the natural being is made, and therefore a positive change and a gradual spiritual growth in the system we live in. Transition is not a common festival, it is an experience with its own mantra and phylosophy: to create a transition point into another dimension to flow, let go, and heal the body and mind. This travel guides you through the posibility to transform your life, leaving behind old mind structures built from hard past experiences. This catharsis makes you discover new unfolded dimensions of your existence through an altered state of consciousness we call Transition. The main propellant of this experience is a sound system of 50.000 watts, precisely arranged through out all past editions, pushing to all participants to an ego disolution, helping to discover the proper place where each of us is blocked in our lives. Transition Festival is dedicated to explore the existential limits and is open to all kind of public, but specially to people really interested in their spiritual growth and human development. Help yourself to confront your life, to heal old bleeding hurts, and find your place in the world. For 2016 edition, we will have 6 days and 5 nights of finest Psychedelic Trance music from respected international and national music lovers. Prepare yourself to dive into another dimension!!! Located near the town of Almonte and surrounded by the stunning beauty of the National Park of Doñana and the Atlantic Coast, Transition land is more ready than ever. The location is clean, renewed, with a clear sunset, asured sunlight and warm temperatures.